Defense strategists place their stakes on high-tech weapons. Nearly all superpowers of the world conduct their works in the development of such weapons. It transpired recently that Russian scientists developed a generator, the capacity of which is comparable to that of a nuclear unit. It is a genuine scientific breakthrough, and it is already clear that the defense industry will not be the only field where the new super device is going to be used. An individual, who is miles away from physics and is only familiar with home electricity, will not be able to imagine the power of several billions of watts. It will be even harder to imagine that such power can be generated by a device that is fit to be placed on a table. “The devices generating such power – billions of watts – used to be very large in size before. This appliance has a very short impulse, which makes it possible to have it on a desk – it is a very compact device,” the Director of Lebedev’s Institute of Physics, Vice President of the Russian Academy of Sciences, Gennady Mesyats said. Mikhail Yalandin, one of the creators of the miraculous machine, said that the scientists had assembled two of such devices in Yekaterinburg – a bigger and a smaller one. Never before had a relatively small device ever been able to generate electromagnetic impulses the capacity of which could be comparable to a huge water power plant. It is ten times as much as any foreign-made analogue. The new device can be used practically anywhere. 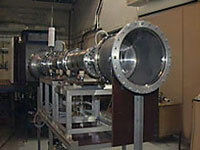 The invention will let specialists create radar telescopes and radars of new generation. Missile troops and defense departments on the whole will most likely be the first customers to order the appliance. The new generators can also be used to check the stability of large energy objects and systems. The device is capable of imitating the strays which appear as a result of a lightning strike or even a nuclear blast. It is impossible to take photographs or film a video of the new generator in action because it immediately puts all electronic devices out of order. The research that was used for the creation of such a device can be applied in the development of electromagnetic weapons. “No one has ever studied biological effects of such impulses. It is obvious that it affects the electronic equipment near it. Computers or cell phones have to be screened from such radiation,” Mikhail Yalandin, a senior specialist of the Institute of Electrophysics said. The device was called Nika, which means ‘victory’.